The decline in unemployment is “real,” meaning it occurred through fewer unemployed persons as opposed to people leaving the labor market. The black unemployment rate, at 6 percent, is only slightly higher than its all-time low of 5.9 percent earlier this year. At its peak in the depths of the last recession, black joblessness was almost 17 percent, meaning it is now down about 11 percentage points, close to twice the decline of the overall rate (about 6 points) and a critical reminder of the disproportionate benefits of full employment to less-advantaged workers. 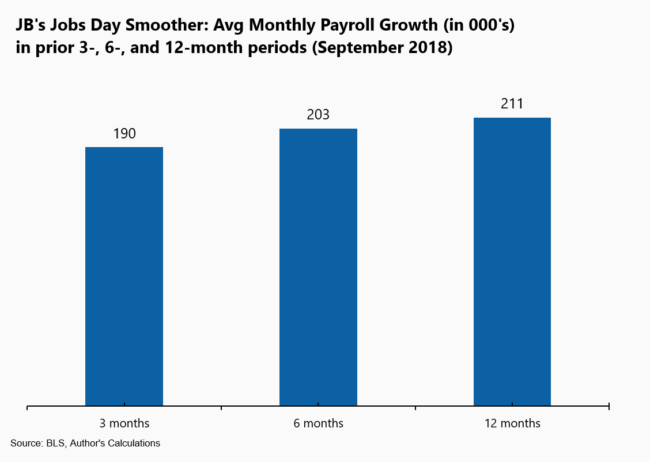 To get a cleaner take on the underlying pace of job gains, our monthly smoother takes averages of the number of jobs added over 3, 6, and 12-month periods. In all three cases, the bars are hovering around 200,000, a very solid pace of job gains for year nine of the economic expansion. 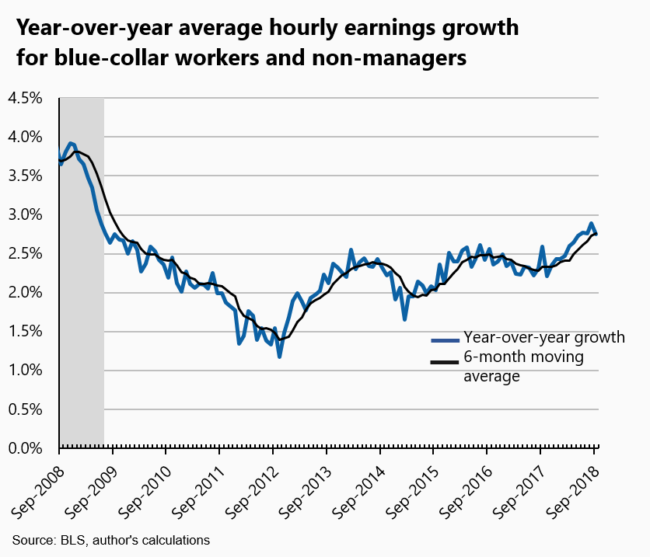 In September, as noted, hourly wages for all private-sector workers grew 2.8 percent on a year-over-year basis, and 2.7 percent for lower-paid workers (the 80 percent of the workforce that’s in blue-collar or non-managerial jobs). The figures below show that the trends for both groups have gained some speed as unemployment has come down. 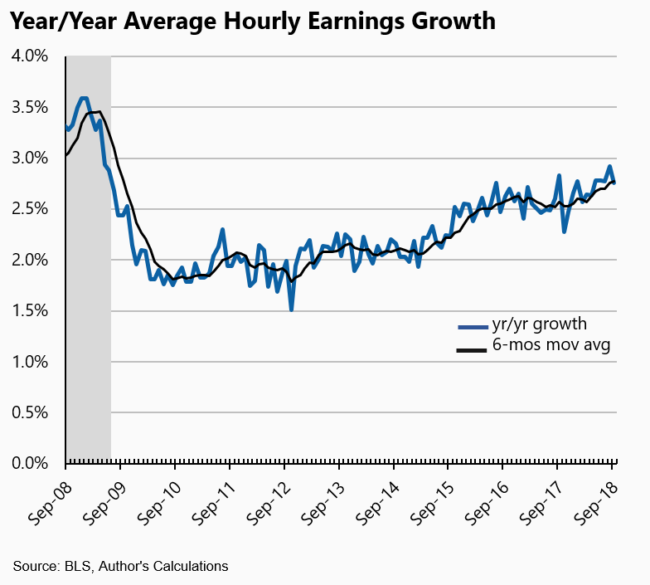 Such acceleration, which, it must be underscored, is occurring at a smooth at not at all unusually quick pace (compare it to the speed of wage growth decline in the downturn), has been long-awaited and should be welcomed, not feared as inflationary. As a figure below shows, there is no evidence that wage growth is bleeding into higher (core) inflation. Turning to the sectoral jobs data, there’s perhaps some Florence effects in the 17,000 loss of leisure/hospitality jobs (which include hotels, waitpersons, food prep) and the 20,000 jobs lost in retail trade (“brick and mortar” stores). But this a relatively small losses in noisy, monthly data, and the BLS series on those who missed work due to weather last month showed a relatively small jump, especially relative to much larger storms in the past. 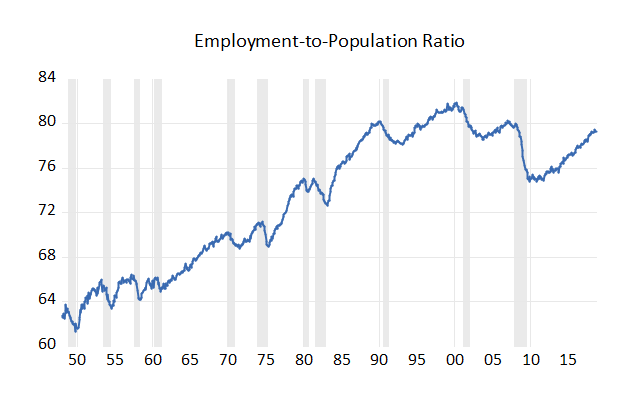 One data point in the report that is less positive is the flat, recent trend in the employment rate for prime age workers (25-54), a measure of labor demand and a source of “room-to-run” claims made about the current labor market. That is, as the figure shows, the prime-age employment rate, while still not quite back to its prior peak before the recession, has been steadily climbing back, signal that the strong labor market was pulling more workers in from the sidelines, and suggesting greater labor market capacity than most economists presumed. However, if the recent flattening (hard to see in the figure, but the rate has wiggled around 79.3 percent for about seven months) persists, it will suggest this source of labor supply could be tapped out. Moreover, as I have written previously, and as you can kind of see in the figure if you squint at it for awhile, this indicator tends to flatten before a recessions. However, whether this is a pause in its upward trajectory or a stopping point is yet to be seen. The last figure is in here to underscore the point made above about how core inflation remains “well-behaved,” even as the unemployment rate is close to a full point below the Fed’s “natural rate” (its estimate of the lowest jobless rate consistent with stable inflation). Even as wage growth slowly trends up (the yellow line in the figure), core inflation is merely at the Fed’s 2 percent target. 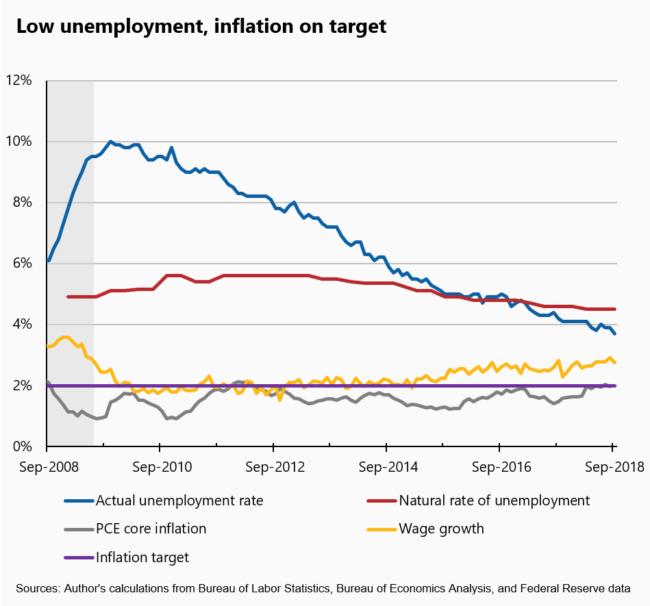 Importantly, since the target is an average, not a ceiling, and given how long inflation has missed the target to the downside, this figure suggests the Fed chair Powell’s view of a strong but not overheating labor market/economy is correct. Hurricanes and the jobs data. The jobs data information comes from two surveys. Payroll and wage data are drawn from the Establishment Survey, while unemployment and much other utilization information comes from the Household Survey. In both cases, the surveys’ “reference period” is the week of the month that includes the 12th, meaning Florence occurred during the survey week. This can affect the data in various ways. First, regarding payrolls, even if someone can’t get to work, if they are paid for work, they are considered to be on the payroll and counted (of course, if a hurricane prevents the submission of data from firms to the Bureau, this could interrupt this process). However, if, due to the storm, someone misses work and is unpaid, they are not counted that week, and this dynamic often suppresses employment, especially in severe cases. Since low-wage workers are more likely to fall out of the survey in this manner, hurricanes can artificially boost average pay, by temporarily taking lower-paid workers out of the sample. In fact, this is believed to have occurred last September during Hurricane Irma, a storm that disrupted a much larger area than Florence. The household survey is a phone survey to individuals, so it too could be disrupted by evacuations. Moreover, its employment concept is different from the Establishment Survey as it counts those temporary absent from their jobs due to weather as employed, even if they are not paid. In fact, the Bureau tracks this number, which, as can be seen here, always spikes during big storms. As noted, a few sectoral job losses suggested a Florence impact, but the BLS reported that survey response rates did not seem much diminished by the storm, so its impacts in today’s report are probably small. Also, such impacts are temporary and storm-induced losses in the labor market tend to be quickly reversed. In addition, repairing the damage from the storms can often show up as a plus for employment, e.g., construction, in later years. Share the post "Unemployment hits a 49 year low as jobs/wages stay on solid, hot-but-not-too-hot, trend." One comment in reply to "Unemployment hits a 49 year low as jobs/wages stay on solid, hot-but-not-too-hot, trend." Household employment is showing a slowdown coming to the establishment side.